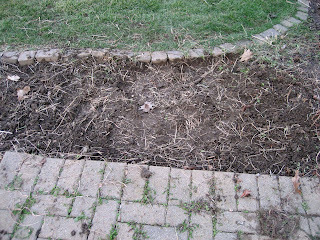 After work, I started on the first steps to renovate this flower bed. The cut out in the patio was the idea of the people who put in the patio. I like it, as I think it makes the corner more interesting. My first plan for the renovation is to widen the entire bed by about a foot so I can have a little more planting room. I'm also correcting the "mistake" of planting Japanese blood grass in here. (All that brown stubble in the picture above.) I don't know what I was thinking when I planted this grass, or maybe I was NOT thinking. Someone gave me a start of it when I first moved in and said it didn't spread very much. 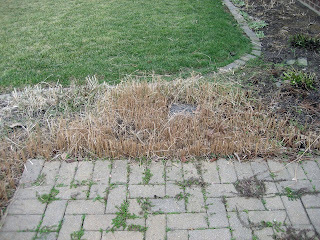 Well, it didn't travel too far each year, but after 9 years, it has spread and it formed a pretty solid mat of grass. 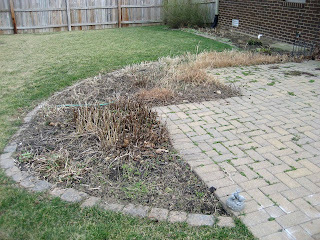 I would recommend it for erosion control on a slope, but not for a flower bed like this. So, I spent the evening digging it out and took three really full wheelbarrows of it back to the compost bins. I did manage to salvage two little Candy Lily seedlings, which I temporarily planted in one of the raised beds in the vegetable garden. The soil was maybe a bit too damp to dig, but I wanted to get most of this grass out before it started to sprout, so I dug anyway. Once other plants start growing, I'll have to dig out more grass, I'm sure, but this is a good start. As noted in a comment from Earth Girl to my previous post about renovating my flower beds, I'll end up with extra plant divisions when I dig out the rest of the plants, once they have started to sprout. One of my sisters already read that comment and called me to stake claim to whatever I have left over. I'm sure there will be enough to share with her and several others. She doesn't realize that I'll probably be begging people to take the extras! It all looks like a muddy mess now, but I know my efforts will pay off for the long run to create a more attractive garden. How can you help? Come over and dig! Ha, just kidding. Send me any suggestions you have for what you would plant. In particular, I am wondering if I should plant a small shrub in the little inset of the patio? It seems to call for a focal point there, but I'm not sure I want something "permanent" like a shrub in this particular bed. Maybe it is a good spot for a small garden statue? Or a big pot of flowers? You all know I am not very good with design and am in it for the plants! And remember I am in zone 5 so don't be suggesting camellias or other plants I can't have! I love the look of this corner bed, what fun you'll have planting. I can't tell the size or shape of the yard from these pictures, but if you wanted to keep the view uncluttered, you could plant various size, low growing plants. And add some yard art/bird water dishes/etc. for interest. Or you could fill the bed full, with tall plants and use containers of tall ones all around the patio, and form a garden 'room'. I enclosed my back patio with tall plants and now am digging them out because it felt too, well, enclosed...imagine! I want a view from the patio. The corner of the patio is angled and I think I'm going to put a pot there, but will be watching your comments closely for other ideas. What fun to rethink such a great area...lots of work, too! I agree that you might not want all tall plants but with what looks like a fair amount of space I'd go for at least some tall shrubs...to draw visitors around the other side of the bed and see what might be hiding. And I would put a tall "garden object" in your inset...an urn with plantings or maybe a bird bath/fountain combo. I've also made small tables and bird baths by stacking graduated sizes of large pots upside down with a saucer on top and painting them with acrylic paint which is inexpensive and reusable if you want something different in a few years. I love renovating new beds, and I notice that they often get a bit bigger. Never smaller. We had a heavy rain yesterday that has temporarily interrupted my gardening. The ground is way too soggy. I like Eleanor's idea of a water feature. Woud be the perfect added touch. 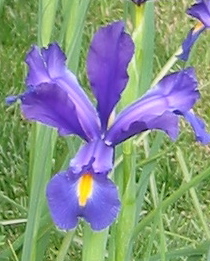 I would put the variegated iris and a Black Lace Sambucus!! Awesome contrast in form and color and spring bloom!!! I would use a hibiscus - huge red flowers that give a tropical feel! I have always wanted a hibiscus but don't have the right 'spot'. 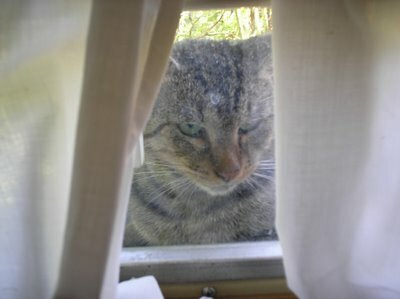 Interesting article, youu make some interesting points.